The United States Congress designated the Jay S. Hammond Wilderness (map) in 1980 and it now has a total of 2,619,550 acres. All of this wilderness is located in Alaska and is managed by the National Park Service. Here the Aleutian Range meets the Alaska Range in the Chigmit Mountains, an area known as Alaska's Alps. The Lake Clark Wilderness was renamed the Jay S. Hammond Wilderness in 2018 to commemorate Alask'a fourth governor. The mighty rain forest along Cook Inlet rises to alpine tundra and sparkling lakes sheltered by mountain fastnesses. Drainages plunge thunderously down hundreds of waterfalls. Vast numbers of moose, brown and black bears, wolves, wolverines, red foxes, Dall sheep, and caribou make their home here. Slender and 50 miles long, Lake Clark itself reflects tall ragged spires of rock, and salmon and trout run in great numbers. Originally a national monument, Lake Clark's status was changed to National Park and Preserve in 1980, and about two-thirds was designated Wilderness. Three Wild and Scenic Rivers offer excellent opportunities for travel in the area: 11 miles of the gorgeous Chilikadrotna River with sections of wild white water; 22 miles of the shallow Mulchatna River flowing out of a jewel called Turquoise Lake; and 51 miles of the unsung Tlikakila River, which runs through one of the most fabulous glacial valleys in America. Tlikakila's waters eventually shed into Lake Iliamna, just outside the Wilderness boundary, the only place in the United States where inland seals live. Two active volcanoes dominate the landscape, visible from the Kenai Peninsula across Cook Inlet: Mount Iliamna (10,016 feet) and Mount Redoubt (10,197 feet). In 2009 Redoubt erupted, spewing ash across Anchorage. A visitor center exists on Lake Clark itself in the settlement of Port Alsworth, but you'll find no facilities or trails within the Wilderness. Once just a trickle, the number of backpackers has been increasing. 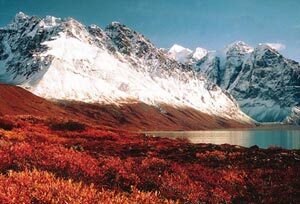 Visitors will find few experiences to parallel Lake Clark. Planning to Visit the Jay S. Hammond Wilderness? How to follow the seven standard Leave No Trace principles differs in different parts of the country (desert vs. Rocky Mountains). Click on any of the principles listed below to learn more about how they apply in the Jay S. Hammond Wilderness.